OFM Mesh Back Office Chair with Black Plastic Seat [336-P] Free Shipping! 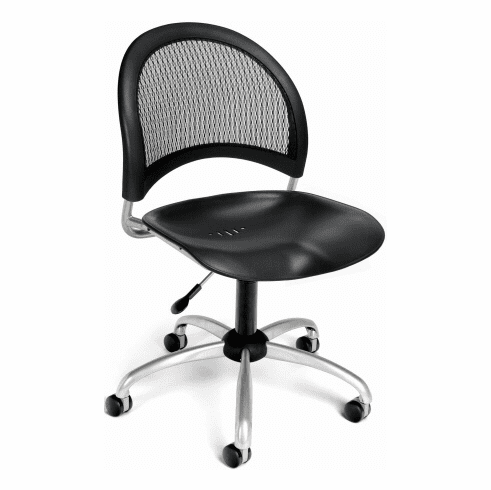 This contemporary styled office chair from OFM features a screened mesh backrest for maximum ventilation and support. Other features include a durable black plastic seat shell with pre-drilled ventilation holes, ergonomically contoured triple curve seat pan, 360 degree swivel, pneumatic seat height control and a heavy duty powder coated five star base with dual wheel carpet casters. Meets of exceeds ANSI/BIFMA standards. Optional height adjustable arms available for a minimal charge. Dimensions: Seat Size: 18.5"W x 17.5"D. Back Size: 19"W x 15.5"H. Seat Height Adjustment: 17" - 21"H. Overall: 33.5 - 37"H x 22"W x 22.5"D. Weight: 35 lbs. Limited lifetime warranty from OFM.